BlueVillas first FAM Trip just ended. 3 days full of activities, inspections and fun. Fam trip stands for familiarization trip and is a get together of travel agents. The goal of the trip was to make the agents familiar with Mykonos island and lifestyle and to show our impeccable service. We wanted to give them the opportunity to know what their guests experience every time they trust us to service and welcome them. 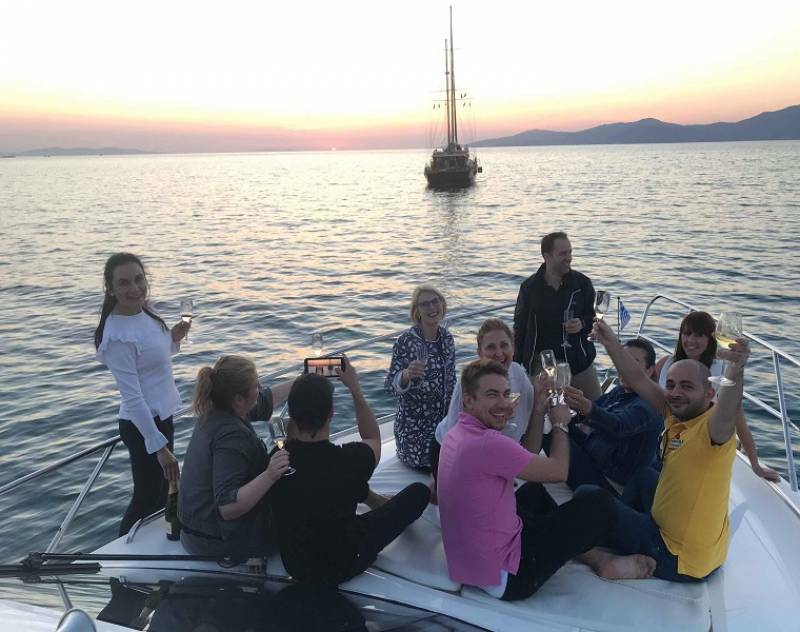 The agents had the chance to experience themselves what luxury means for us and why we have already been awarded twice for our service. Our fam trip welcomed 5 agents who stayed in one of the best villas of our collection, Fabiana. Our BV team met with the agents on Friday evening to welcome them to their luxury home. The first night, the dinner was an authentic thematic gastronomy dinner, signed and created by BlueVillas chef. The second day the schedule was full. BV had arranged the inspection of villas in the different areas of Mykonos, each with unique features and concept. In the afternoon, one of our trusted partners helped us discover some local secrets of Mykonos. Dressed in his traditional costume, he took us to a farm for a fun cheesemaking experience and then to the Ano Mera church – said to be extremely miraculous. We separated with our guide at 180 Degrees Sunset Bar where we indulged in a magic sunset experience accompanied by cocktails. After that we let the agents explore the famous Mykonos night out by themselves. Next day, more villas and inspections were waiting for us. After a small afternoon break, we embarked on a cruise with a private yacht. We started from Mykonos port and explored the area of Korfos. Our chef had taken care of our lunch with finger food and lots of champagne! The yacht left us at the majestic spot of Little Venice and then we headed off to the highlight of the day. We attended the grand opening of the famous all-day bar-restaurant, Scorpios, next to international jet-setters. What a night! The 3-day trip passed too quickly and we are already looking forward to the next one.Till then we keep getting inspired by our luxury Mykonos villas! Book now!